This article is a short summary of Mario & Luigi: Dream Team. 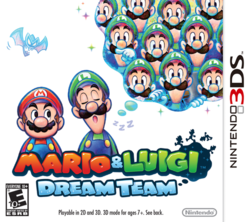 Mario & Luigi: Dream Team (titled Mario & Luigi: Dream Team Bros. in Australia and Europe) is the fourth game in the Mario & Luigi series of role-playing games, released in 2013 as part of the Year of Luigi celebration. As such, the game puts more of an emphasis on the character of Luigi, giving him a larger role than in previous titles. In Japan, North America, and Europe, a Nintendo 3DS XL bundle was released that featured a Mario & Luigi-themed console and a digital copy of this game pre-installed. The Adventure of Mario's and Luigi's Dreams! Join the bros. in a hilarious action RPG that bridges the world of Pi'illo Island an the impossible landscapes of Luigi's imagination! Team up for Bros. Attacks! Anything is possible with Luigination. Messing with Luigi affects the dream world! Mario and Luigi embark on the adventure of their dreams in a hilarious action RPG that combines the real world with the wild landscapes of Luigi's imagination. In Luigi's dreams, anything is possible – legions of Luigis morph into forms like a bouncy tower or a wrecking ball. You can even poke a sleeping Luigi to alter events in his dream world. While on vacation on Pi'illo Island, the bros. discover that Luigi's sleeping mind can open portals to the dream world. Mario & Luigi can team up for supercharged Bros. Attacks. In the dream world, Mario can use Luiginary Attacks to assemble a hoard of Luigis into attack formations. Adventure with Mario & Luigi to not only rescue Peach, but to help Prince Dreambert free fellow Pi'illo folk from the bat-king Antasma's petrifying spell. Princess Peach receives an invitation inviting her to take a vacation on Pi'illo Island. On the way there, a dark being shows up on the blimp and Mario fights it, but it turns out to be Luigi's dream. On the island, Mario and Luigi head into the ruins in Pi'illo Castle and find a pillow. After arriving in the collection room, Luigi takes a nap on the pillow and opens up a portal to the Dream World. However, a hand appears and captures Princess Peach, and Mario dives in after her. After catching up to the creature and defeating his diversion, he escapes to Dream's Deep, though Mario and Dreamy Luigi are able to free Prince Dreambert from his nightmare chunk. Dreambert explains that long ago there were two magical stones the Pi'illo were protecting: the Dream Stone and the Dark Stone. The same villain, named Antasma, came to take the Dark Stone to fulfill his dark desires, though the Pi'illo people sealed him away in the Dream World. However, Antasma broke the Dark Stone, which caused the Pi'illo people to be petrified. Now that he has been freed, Dreambert states that Antasma is on his way to obtain the Dream Stone. Mario and Luigi must chase Antasma through the Dream World and both stop him from obtaining the stone and save Peach. Overall gameplay remains similar to the previous games in the series. Unlike in the previous two games, players are back to controlling just Mario and Luigi. Overworld gameplay is similar to Bowser's Inside Story, featuring Mario and Luigi traveling through 3D overworld sections and Mario joining "Dreamy Luigi" in the Dream World. While in the Dream World, Dreamy Luigi can access "Luiginary Works", in which the player can manipulate Luigi in the real world using Starlow to affect elements in the Dream World. Battles are similar to how they are handled in previous games, allowing players to attack with the hammer and jump as well as being able to dodge enemy attacks. While this is no different in the Dream World, Mario is instead empowered by Dreamy Luigi when facing a hoard of enemies, giving him greater attack power and allowing him to attack multiple enemies using a group of Luigis. In addition, while in the real world Mario and Luigi use Bros. Attacks to attack, in the Dream World the player is able to use Luiginary Attacks, in which the player amasses a group of Luigis to attack most enemies. Giant battles also return from the previous game in which the player faces the giant enemies as a giant Luigi, and the mechanics operate similarly to the giant Bowser battles from the previous game. On August 11, 2013, the same date as the game's North American release date, a demo of the game was released on the Nintendo eShop. The demo has twelve uses and requires 1,010 blocks to download. The demo allows players to play through one of three segments: the Real World, in which players play through a section of Mushrise Park; the Dream World, in which players play through a combined area in the Dream World to show of Luiginary Works; and a Boss Battle, in which players face either Grobot in the real world or Bowser and Antasma in the Dream World. 1.1 September 5, 2013 Fixes a glitch on Mount Pajamaja that prevents players from progressing; fixes a glitch with the final Antasma battle that makes the battle unbeatable; fixes other game-freezing glitches. This page was last edited on 21 August 2016, at 04:00.